We all tend to have differently shaped and sized hands and fingers. In this article I’m going to talk about different types of fingers: chunky, thin, long and short. Some disadvantages, benefits and ways to deal with some of the disadvantages. Wider fingers have more surface area on their tips. This can cause difficulties for the fretting hand with strings that are closer together such as those of the electric guitar. For example it might be harder to fit the 1st, 2nd and 3rd fingers in on the D, G and B strings for an A open chord as shown in the first diagram below. Using the 2nd, 3rd and 4th fingers can help, as shown in second chord diagram. The use of the little finger contributes to a less tighter fit for the three fingers. Wider fingers may find it easier to play a partial barre. For the last diagram is an A chord played as a half barre, you won’t hear the high E string but the chord still contains notes that make it a major chord. For partial barring the “Smoke on the Water” riff comes to mind, where you half barre across the D and G strings. Classical guitars are good for beginners as they have nylon strings, which are easier on the fingers of the fretting hand. They also have strings spaced further apart. 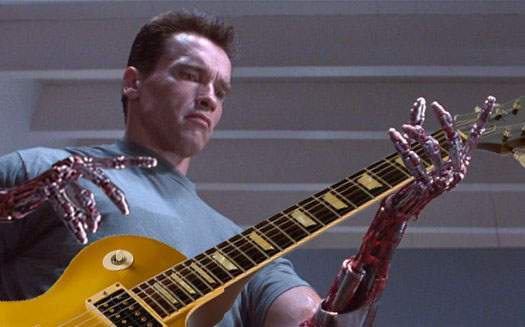 Some people may have fingers of a size that makes trying to squeeze them in for an A chord seem impossible so a guitar with strings further apart can make a difference. On the other hand, wider fingers may find the “finger roll” easier. 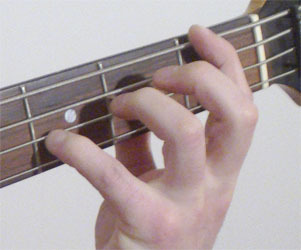 The finger roll is moving between notes that are on the same fret of adjacent strings, as shown on the animated picture. Thinner finger-tips with less surface area have more clearance between the strings when pushed down on the frets, making it easier not to affect other strings. For thinner fingers, finger rolls can be more difficult, you have to rely more on rocking the end of the finger by its joint (as shown in the previous animation). Sometimes a finger roll is even done with the little finger. Note that finger rolls are relatively rare until you get to intermediate / advanced level. Longer fingers can find it easier to span more frets without having to move the hand up or down the fret- board (and minimal movement is always better for speed). However a full Barre chord could be a bit more difficult for a beginner with longer fingers due to less leverage. Although they might have more leverage for full barre chords, shorter fingers won’t have as much span across the frets, particularly on the Bass guitar, which has its frets further apart (especially at the bottom of its neck.) As much as it makes good practise to span your fingers out across as many frets (yes that’s 4), if the stretch is so far that you can’t get enough force behind a finger to push down on the fret, then there’s no harm in moving the hand up or down a little to reach these notes. 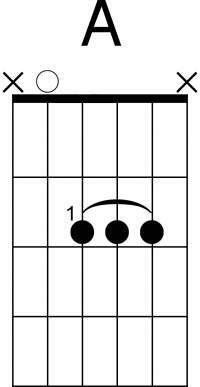 In the animation this is demonstrated between the 1st and 4th frets of a Bass guitar using the 1st and 4th fingers. Similarly, using the 4th finger for octaves on the bass is not uncommon. On the next picture, the hand is spanning the 1st and 4th fingers over 2 frets, with the 1st finger on the 1st fret low E string and the 4th finger on the 3rd fret G string. This is by no means a comprehensive list of all possibilities. Other discoveries can be made in practise. Don’t be too perturbed or resign yourself to difficulties that are due to your fingers. Not having really long fingers hasn’t stopped me from playing the Bass. How you practise and how disciplined you are, are more important.